Video below shows how to assemble 2 pieces of LED lamps without soldering. These LED lamps can emit colorful rays: red, green, blue (RGB). 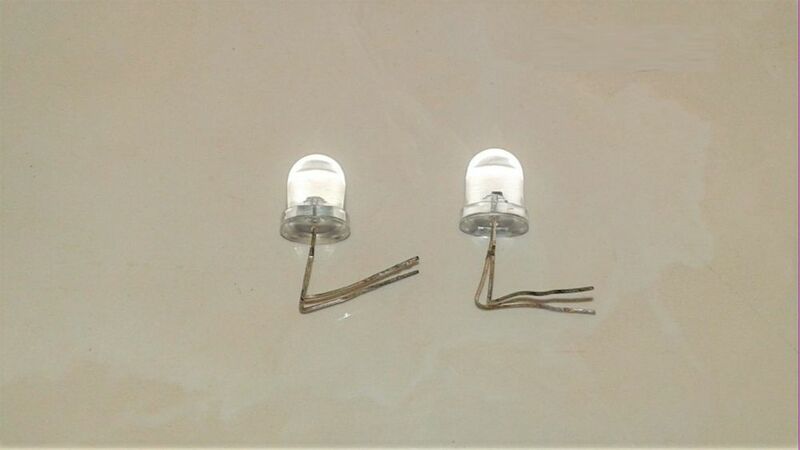 Also read: Small LED is supplied by 220 volt voltage without transformer. See the image below, the leftmost image is the LED symbol. The center image is a side view of the LED. It can be seen that LED has two pins: the long pin is the anode (A, positive) and the short pin is the cathode (C, negative). There is also a flat section (F) of the LED circular housing near the negative pin, as shown in the rightmost image. Both LEDs are connected in parallel, see below schematic. The pins are bent at 1 cm from the base. Positive pin is connected to positive pin, and negative pin is connected to negative pin. See also: how to make adjustable 220 volt flashing lights. Then a CR2016 or CR2032 coin battery is inserted between the two LEDs, then both LEDs will light up. Isolation tape can be used to ensure pins connection. Those components are then inserted into glass containers such as drinking glass, vase, etc., so it becomes a decorative decoration that emits colorful twinkling rays. More clearly can be seen in below video. See article about: battery indicator with LED. CR2016 battery has a diameter of 20 mm and a thickness of 1.6 mm, while CR2032 battery has 3.2 mm thickness. Both batteries have 3 volts voltage. Thicker battery has a bigger current and capacity.